With Halloween just around the corner, and us involved in the biggest and best Halloween party in Naples, we have been feeling more festive than ever. So when TruMoo asking me to help them come up with a Halloween recipe, I was happy to accept the challenge. Last week, I dusted off one of our favorite recipes – Chocolate Chip Pumpkin Bread. So I guess I was still feeling the love for that bread when I thought out this recipe. With a touch of cinnamon and a little pumpkin to make it festive, these are the type of special pancakes that you might only make a few times a year, but that you savor with every bite. No one even thought about asking for syrup as they gobbled them down. 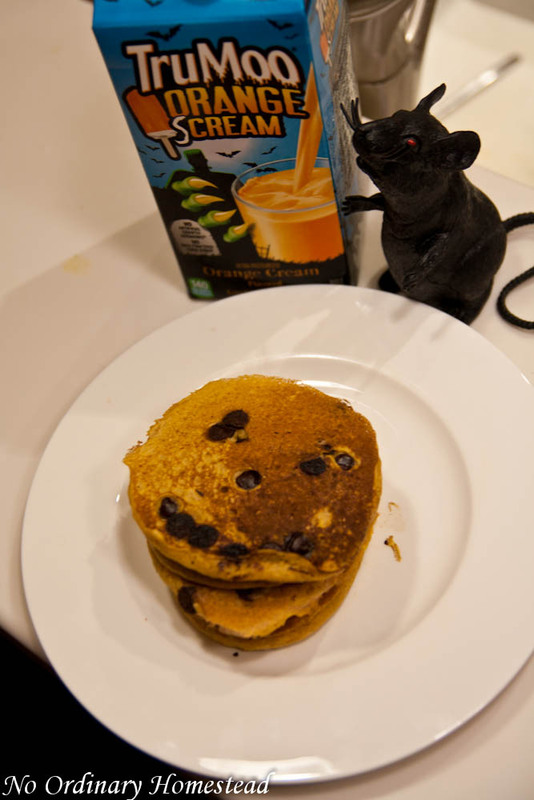 When you make these pancakes, one important person you will want to have on hand is a good mixer. And Mack is a pro! Plus she’s getting to be a pretty good taste tester. And she had the perfect spooky skull shirt on to get us in the Halloween spirit. 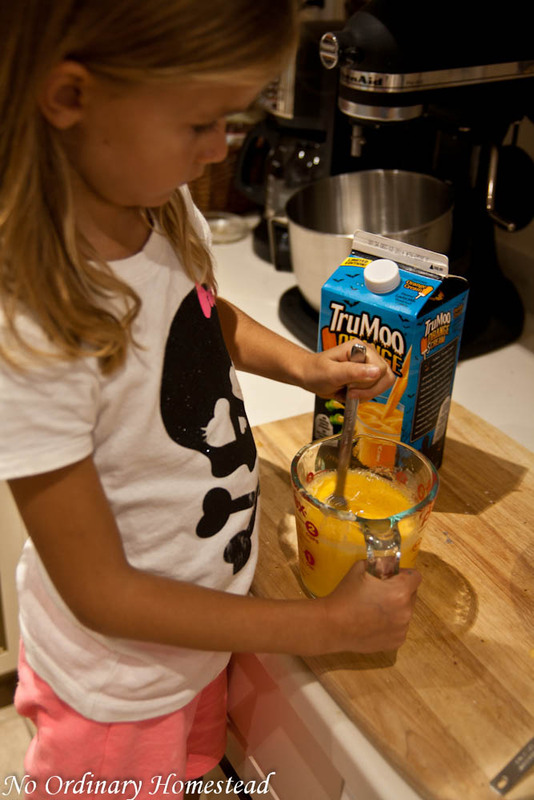 If you’re looking to bring some extra Halloween fun into your home, be sure to check out TruMoo on Facebook, Pinterest or to visit their website for more delicious TruMoo Halloween recipes. There are lots of fun and yummy ideas! Do you have any favorite Halloween traditions or recipes to share? Mix together TruMoo milk and vinegar. Let sit 5 minutes. In a large bowl, mix together flour, sugar, baking powder, baking soda, salt and cinnamon. Add egg, oil, vanilla and pumpkin to milk mixture. Stir well. Pour wet ingredients into dry. Mix well until all lumps are removed. Lightly grease and preheat griddle or pan to medium heat. 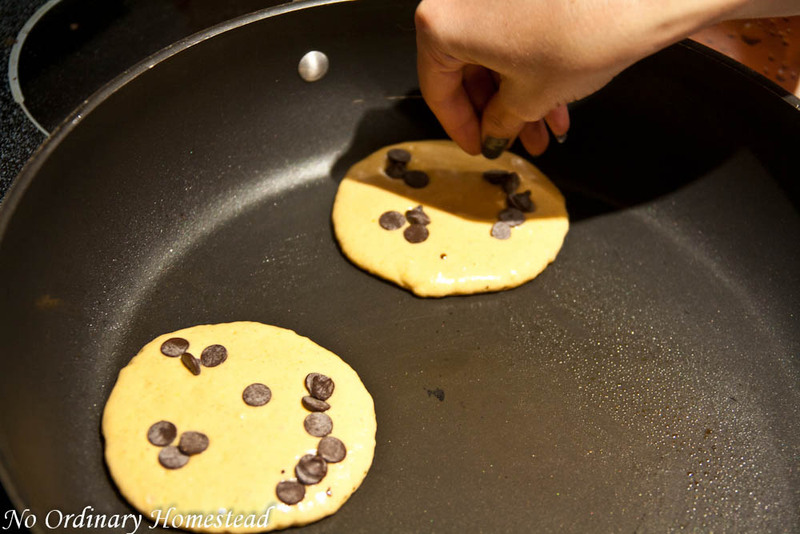 Using a 1/4 cup measuring cup, ladle pancake mix onto griddle. 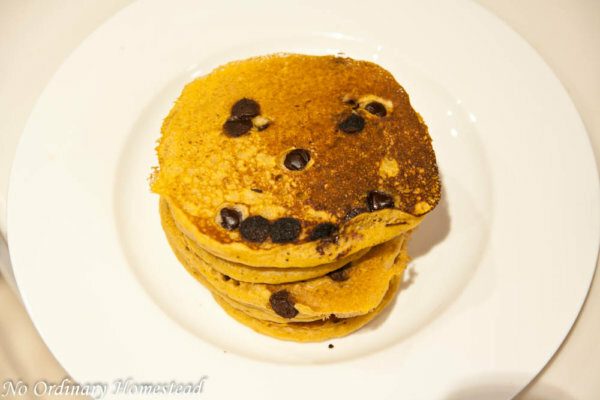 Add chocolate chips in a jack-o-lantern face pattern. Cook until bubbles form. This mixture will not bubble quite as much as regular pancake mix. Flip. Cook on other side until light brown.